The Java String compareTo() method is used for comparing two strings lexicographically. Each character of both the strings is converted into a Unicode value for comparison. If both the strings are equal then this method returns 0 else it returns positive or negative value. The result is positive if the first string is lexicographically greater than the second string else the result would be negative. Here the comparison is between string literals. For example string1.compareTo(string2) where string1 and string2 are String literals. Here the comparison is between a string and an object. 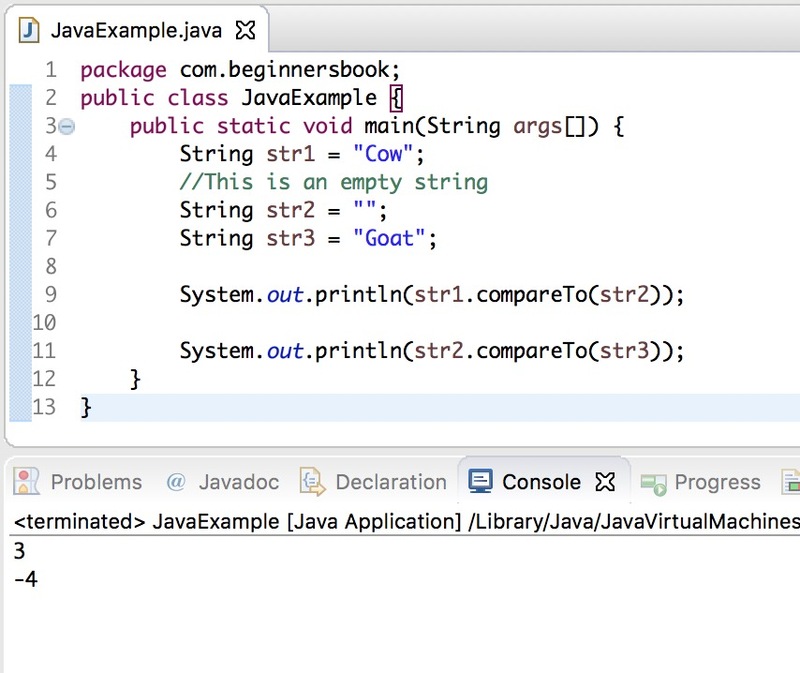 For example string1.compareTo("Just a String object") where string1 is a literal and it’s value is compared with the string specified in the method argument. Here we have three Strings and we are comparing them with each other using compareTo() method. Here we will see an interesting example of how to use the compareTo() method to find the length of a string. If we compare a string with an empty string using the compareTo() method then the method would return the length of the non-empty string. In the above code snippet, the second compareTo() statement returned the length in negative number, this is because we have compared the empty string with str1 while in first compareTo() statement, we have compared str1 with empty string. 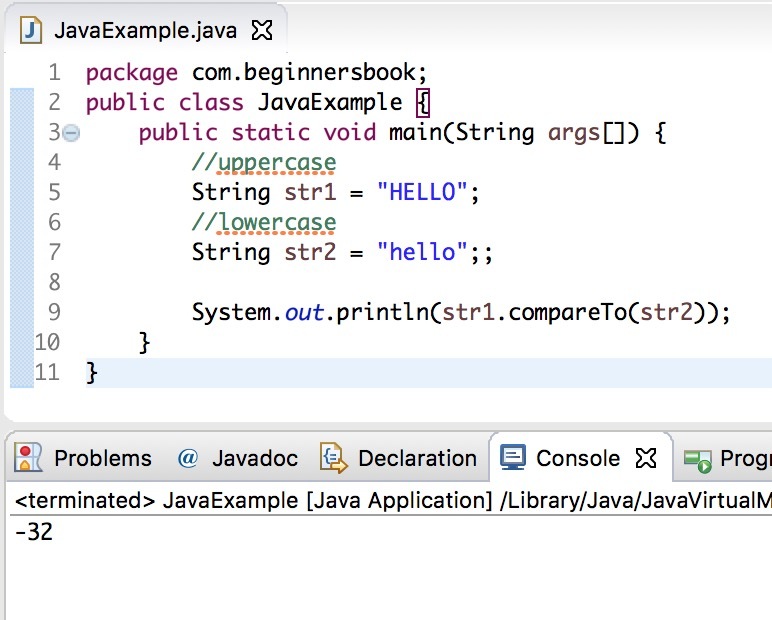 Is Java String compareTo() method case sensitive? In this example, we will compare two strings using compareTo() method. Both the strings are same, however one of the string is in uppercase and the other string is in lowercase. As you can see that the output is not zero, which means that compareTo() method is case sensitive. However we do have a case insensitive compare method in string class, which is compareToIgnoreCase(), this method ignores the case while comparing two strings. If both the strings has space in them? Also if the no of characters in both the strings are not equal then what will be the output? I think a better description of what this method does is that it compares the FIRST character that is not equal in both strings. Anything after that will NOT be compared, whether one string has more or less characters are equal or not. The interger given in the result is based on the difference in value of the characters in the ASCII chart. This would apply for the space as well. If space is placed as the first distinct character in the two strings, then it would be compared depending the ASCII values of the two characters. For example, if you compared a space character (which has a ASCII value of 32) to a comma (which has an ASCII value of 44) using the compareTo() method, assuming that they are the first distinct chracters found in the two strings, then the result would be the difference between 32 and 44, which is -12.